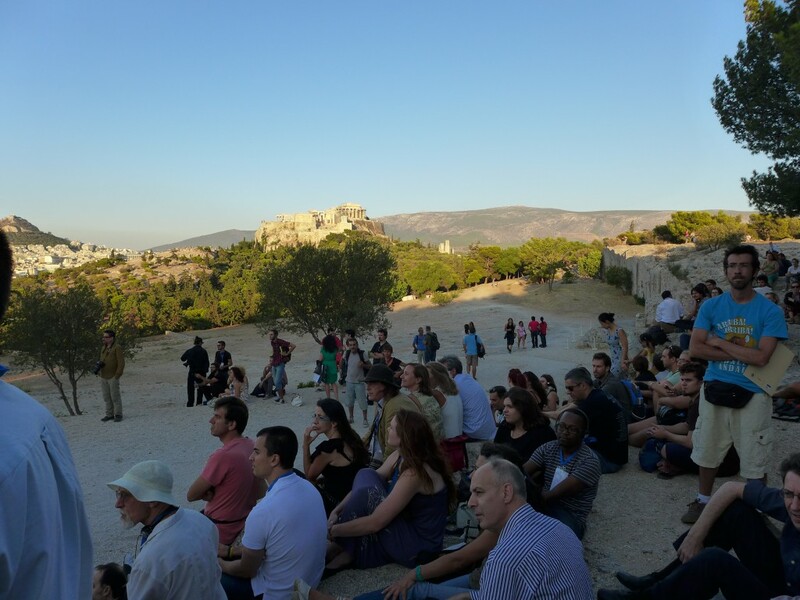 In line with the theme of the conference, a session run by the International Institute of Philosophy took on theme of “Vivre en Philosophie” (Living in Philosophy). 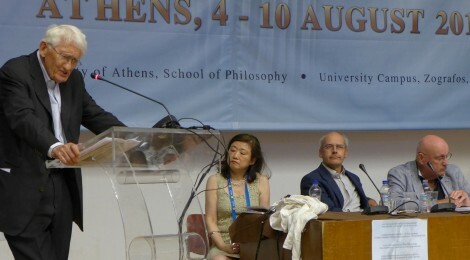 French philosopher, Anne Fagot-Largeault presented “La philosophie comme manière de vivre En Hommage à Pierre Hadot” (“Philosophie as a way of life in homage to Pierre Hadot” In her paper, Fagot-Largeault took particular issue with the impact of analytic philosophy and the mercantile practices of the contemporary academy, which infringe on the practice of philosophy. She argued, “Today a philosopher is seen as a Professor, as someone who ‘teaches’ Kant, but a philosopher is, traditionally, someone who knows that she does not know, someone who creates and initiates new thought.” Additionally, she noted that today publication is seen as the foremost sign of philosophical understanding. Such faulty perceptions have an impact on the way young philosophers are being trained. As a result, she complained that aspiring philosophers are advised to attend colloquiums and publish in peer reviewed journals. There is a haste, therefore, around philosophical production, which has resulted in a lose of careful thinking. She notes, in starch contrast, Wittgenstein’s recommendation at the end of his Tractatus, “Sur ce dont on ne peut parler, il faut garder le silence. ” (On that which we cannot speak, we must keep silence). In contrast to the common suggestion that philosophy must transform to contemporary trends to preserve its existence, Fagot-Largeault argued that philosophy must re-visit its past. Her suggestion was that philosophy is in crisis, because it has not remained true to its original mandate and its originary culture. She locates this change in the 1930s when analytic philosophy introduced rigid notions of logic and standards of rigor into the academy, which changed the perception of the role of the philosopher. She argued that the originary purpose of philosophy was theological and/or spiritual. There was a time when reasoning and logic were considered unimportant and merely rhetorical. “Philosophy was meant to illuminate the mysteries/enigmas at the depths of life.” Philosophy was meditative. Today, it is “purely verbal–taught, written, published.” However, she argues, true philosophy is lived. “True” Philosophy, as she sees it, is meant to transform one’s understanding of the world. She reminded the listeners that ancient philosophy never aimed at the creation of systems. It was meant to be applied in the process of the formation of human personality, not to theorize the world. There are no systems. It is an illusion….We need to rediscover a serious tradition of philosophy.” Still. what is this serious tradition of philosophy and who dictates its norms? The central problem with the diagnosis of philosophy’s current challenges that McIntyre, Fagot-Largeault and others offer is that these critiques remain blind to the normative challenges of practicing philosophy in an increasingly global and diverse academic space. In particular, these criticisms remains unprepared/unable to consider the following: Perhaps the problem is not that philosophers are not doing philosophy in an “ideal” manner. Instead, perhaps the real problem is with the ideals that philosophers hold. The current debate on the future of philosophy swings violently between Quinean positivism on the one hand and Socratic asceticism on the other with no stops in-between. Both poles represent discussions of philosophy according to the narrow and decreasingly relevant world views of a limited clique of Euro-American traditions. Fagot-Largeault addressed issues of “philosophical practice” and “the formation of human personality.” However, neither of these concepts are straightforward, empty of normative content or a matter of easy agreement. What is considered as correct/desirable practice depends upon accepted norms or rules. In turn, the formation of the human personality is directed at these variable standards. A philosophy of practice is therefore, necessarily complete and conclusive–normatively speaking. Disagreement is only a matter of nuance and detail. It is a philosophy, therefore, that has by-passed the possibility of critique and/or dissent. In more homogenous Euro-American societies, the conception of a normatively conclusive tradition of philosophical analysis might be practicable. In diverse landscapes such as India, such a singular tradition of philosophy would have no chance of surviving on its own because in a heterogenous world, such a homogenous tradition of philosophy would amount to intellectual tyranny. Therefore, a philosophy of practice or a philosophy based on idealized notions of practice will not suffice in an increasingly global context because of the diversity of views on what constitutes correct practice. As long as there is difference in human opinions, (even if the dissent constitutes a minority of one) there remains need for a public forum to talk out, if not reason in favor of/against divergent and opposing human opinions. Philosophy has a powerful role to play as the locus of this forum. He understood science as system of knowledge about the world, especially based on examination and testing. He noted two meanings of “science” in Japanese: Kagaku and Rigaku. Kagaku describes the many branches of science. Rigaku stands for the learning of laws or the order of the universe, In Japan, the term Kagaku has become increasingly popular and ubiquitous in its usage. Rigaku, on the other hand, remains in use only in the formal names of faculties in Japanese Universities. Noe argued for a close relationship between Science and Philosophy. He locates this proximity in Newton’s own philosophical inclinations. He narrated the origins of the scientific revolution in Europ in the 1840s, which resulted in the establishment of scientific societies and programs of higher education. Through this revolution, he argues, “science” became “sciences.” Japan imported “sciences” as a post-revolutionary packet. As a direct result, he agues, Japanese scientists “neglect the origins of philosophy of science in naturalist philosophy.” Therefore, they deeply associate science and technology. He argues that this neglect, which amounts to a utilitarian approach to science favored by the likes of James Watt, directly led to the disaster at Fukuzawa and Yukichi. He argues that Japanese scientists are more likely to place the influence of Watt at the heart of scientific thinking, and not that of Newton or Darwin. Noe then proceeded to discuss the second phase of the evolution of scientific thinking in Japan: the contemporary move from sciences to trans-sciences. He brought attention to Terada Torahiko, an essayist who focused on the relationship between civilization and disaster. Torahiko argued that the original cause of disasters (like the recent disasters in Japan) is human resistance to nature. Torahiko thought of disaster in terms of natural disasters and disasters of civilization that were purely impelled by scientific, political and economic forces. Torahiko and other similar thinkers, Noe argues, brought attention to the notion of “trans-scientific problems.” These are issues, epistemologically speaking, that arise because of science, that can be asked by science, but cannot be answered by science. They are problems that arise in the course of the interaction between science and/or technology and society. Noe proposed that currently, while people are aware of the existence of trans-scientific problems, the current culture of mission oriented, industrial science and scientific entrepreneurialism has had a significant impact on the ability to tackle trans-scientific questions beyond the grip of immediate gains and market based profiteering. There is little weight given to the long-term consequences of scientific inquiry. As a result, science suffers from “organized irresponsibility.” In contrast, Noe turns to the “intergenerational ethics” of Native American societies. In Wild Philosophy (2011) Keijiro Suga notes, “Whenever a meeting of the tribe is held people swear their duty by the following words: ‘Whatever matter we decide, we must decide for the future seven generations.” Scientific culture today lacks the force of such ethical guiding principles. For this reason, Noe calls for the transition from Trans-science to Philosophy of Trans-Sciences. The philosophy of trans-sciences, he argued must lend science the ability to consider issues from the perspective of their moral and social impact. Philosophy, Noe held, has an important role to play. He ended by presenting three descriptive frames for each of the three stages he outlines. For the first stage, he cited an acronym developed by Robert Merton: CUDOS (community, universality, disinterestedness, organized skepticism). For the second stage, he cited John Ziman’s caricature of Merton’s set: PLACE (propriety, local, authoritarian. commissioned and expert). For the third stage, he suggested a new and original acronym: RISK (regulative deliberation, intergenerational ethics, social accountability, knowledge product liability). Noe’s exploration demonstrates the importance of thinking about the context and content of philosophy afresh–even in the context of “scientism.” Noe draws from a variety of traditions and disciplines, while maintaining focus and precision in his argumentation. His discussion, while drawing from local philosophy, language and culture, nonetheless connects to global phenomena–making the increasingly urgent connection between the global and the local. As he considers a major challenge that has faced Japanese society, he presents an analysis relevant and useful to people across the world. The image of the philosopher as a bearded white man–a casual consequence of geo-politics and warfare rather than an accurate visual representation of the global and historical contributions to collective human thinking, has sapped philosophy of its energy to renew itself. It has restricted its reach and its grasp. It has made philosophy an exclusive and therefore uninteresting club of arrogant men studying outdated ideas along with a handful of token women and other minorities. Philosophy which has been produced through out the world and throughout the course of human history, has been reduced in the age of the academy to a field of white men studying the ideas of other white men. McIntyre is correct to attribute the current dilemma to the inertia and introversion within philosophy departments. Fagot-Largeault is correct in assessing some of the challenges that professional academic culture poses to the intellectual and practical context in which philosophy is produced. However both scholars miss the essence of the contemporary dilemma: the current lack of representation in terms of demography and ideas, in the contemporary field of philosophy. This lack of representation effects the treatment of all philosophical discussions from issues of trans-sience to issues of individual philosophical practice. On the third day of the conference, Habermas spoke on the constitutionalization of international law at an Invited Session held in his honor entitled, “Cosmopolitanism.” Habermas spoke mainly of the importance of the European Union as a model for global solidarity. As a German speaking in the heart of the Euro-zone crisis, his perspective seemed myopic and partial. His arguments lacked consideration of current socio-cultural realities and views of religious and socio-economic minorities. Although he presented a Euro-centric understanding of global politics, he paid little attention to the current economic crisis in Greece. To add to this, the philosophical content of his sketch of the notion of solidarity was fairly conventional, offering no new or original insight. More engaging than Habermas’ speech was the forceful but nuanced rebuttal put forward by Professor Arne Johan Vetlesen, from the University of Oslo, which challenged Habermas’ loosely considered notions of solidarity. He presented several counter examples, including the recent terrorist attacks in Sweden committed by Anders Behring Brevik, which complicated Habermas’ homogenous presentation of European solidarity. Vetlesen argued further that the “understanding of rights and politics must be open to new thinking and dissent.” He argued that plurality must be the central pillar of politics and that politics must function to build worlds between different people. Borrowing from Hannah Ardent, he suggested that human artifice cannot be understood correctly from a single perspective. He finally warned of the dangers of championing loose notions of solidarity. The session was a visceral reminder of the rift between philosophy’s current Euro-centric and patriarchal cannon versus the increasing diversity of a global society. Traditional academic philosophy is dominated by an accepted cannon that is out of date and, at the very least, in need of substantial renovation. It is a cannon that was developed and organized for the purposes of nationalist and imperialist projects and therefore provides no room for plurality, or even difference. What white men thought was of great interest to people of the world when white men held exclusive dominion over the world’s most powerful weapons and most important resources and technologies. As this power balance is quickly altered, the motivation for engaging with the traditional Euro-American cannon seems weak. Instead of studying philosophy, students are now studying Chinese, or studying new and relevant ideas found in the Computer Sciences and Information Technology. If one accepts the notion that wisdom, inspiration and reflection can be found in a variety of sources–from dreams, to chance encounters, to verses of poetry, then it is not clear why anyone (except philosophers) should privilege philosophy’s current canons over other canons. Nonetheless, most philosophy departments still insist on a genealogical pedagogy that takes students through a doctored narrative of philosophy with Socrates at its roots, Renée Descartes at its base, Immanuel Kant as its trunk and G.W. Hegel, Gottleb Frege, Bertrand Russell and a stream of other thinkers as its divergent branches. Even if one nullifies the history of philosophy and begins with the canon of purely contemporary thinkers, the image does not change. Such a genealogy gives the distinct feeling that only white men are capable of producing rigorous thought. The connection between the racial and gendered composition of this canon and Imperialism, which posited the superiority of the white male, is worth considering. From this perspective, in the context of the Imperial cannon, the philosopher’s canon functions like a soft caste system that dictates who can be considered an intellectual authority, who can think and who must follow. What use does such a canon hold in the contemporary post-Imperial world? This is the question that philosophy has yet to answer in any determinate manner. Striking a positive note for the future of philosophy, by the end of the 23rd Congress, it was decided that the 24th Congress of Philosophy would take place in 2018 in Beijing, China. The events will be organized by the Department of Philosophy, Peking University. While this announcement supports the attempt to create a truly global community of philosophers and de-center philosophy from its current Euro-American anchors, concerns with regard to pluralism and representation still loom large. The greatest challenge with the contemporary form of academic philosophy is that it is virtually incapable of harboring plural and contradictory ideas. Every kind of contemporary problem solving demands engagement across a broad variety of frames, experiences and even cultures. Thus far, in its persistent homogeneity, philosophy has been unable to respond to this need. Therefore, it is no longer perceived as an active space of intellectual engagement. As a direct result is increasingly hard to convince people of the relevance of philosophy. Hadot is invoked because he held that philosophers should be judged by their actions and not their words alone. He argued philosophy was a living practice and not merely a theoretical understanding or interrogation.